It is amazing how many times people have asked me how to set up the strike trains of a three-weight Vienna regulator mechanism. And, while I like to think I am good at setting up these trains, it seems like each one I work on teaches me another little trick or necessary step to make sure they perform as originally intended. When set up properly, they truly are a dream. I plan to cover various aspects of this subject in future Technical Tid Bits. This Tid Bit focuses on one of the things that can keep even a well set-up strike train from working. While I am using a Vienna Regulator mechanism for this explanation, any clock that uses a rack and snail strike system can likely have similar challenges. It’s just that Vienna’s, with their very light weights, perhaps are more sensitive than a British long case clock or the like. Troubleshooting a strike train involves getting everything set up correctly, and then, when it doesn’t work, finding sources of undue friction or binding that have developed due to wear. Needless to say, the pivots on the gears in the strike train need to be stoned and burnished to perfection. This in itself will eliminate many of the challenges these trains present. This Tidbit focuses on two sources of binding that I have seen, a very small thing, but one that can shut down the whole process. Let’s start by looking at a picture of the front of a typical 3 train Vienna Regulator mechanism. 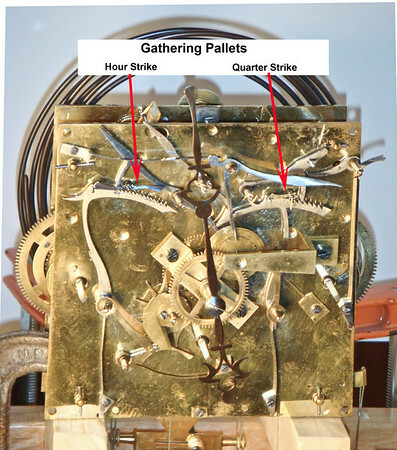 The arrows point to the two gathering pallets – the one on the left for the hour-strike train, the one on the right for the quarter strike train, and the subject of this Tid Bit.